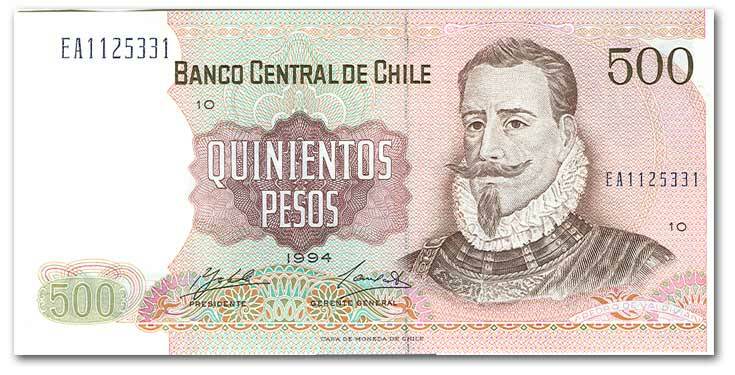 We begin Chilean money with Pedro de Valdivia, conquistador, explorer, city-founder, member of the Hair Club for Men as well as President, etc. Like many in his social circle, he had a keen interest in gold, and spent much time in pursuit of native riches, only to die from gold poisoning in 1554. By which I mean he was captured by the locals, who poured molten gold down his throat. Gargle that, Pete.